Wells Fargo Mobile® is a fast, secure, and free* service for Wells Fargo and Wells Fargo Advisors clients. It is available 24/7 using your existing Wells Fargo Online® Username and Password. Your security is our priority — Mobile data transmissions are safeguarded by 128-bit SSL (Secure Socket Layer) to prevent unauthorized access. Our Online Security Guarantee provides added protection against unauthorized access to your accounts. We will never transmit your account number. 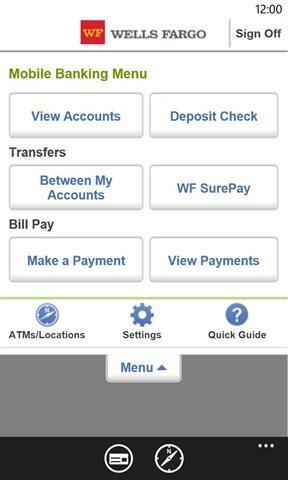 ACCOUNT ACTIVITY • View your account balances and activity - For consumer accounts, view check and deposit images • Available balance and pending deposits • Search and Sort • Detailed transactions list. • View your credit card rewards balance WELLS FARGO SUREPAY • Send money, using a mobile number or email address, to friends and family with eligible accounts at participating financial institutions. 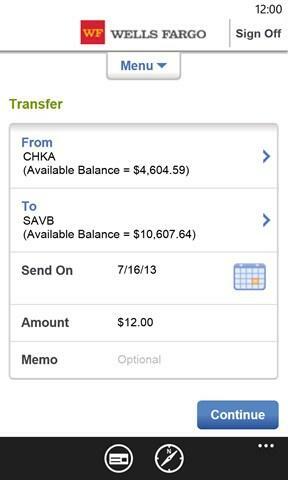 TRANSFERS AND PAYMENTS • Make transfers to your accounts. BILL PAY • Schedule payments and pay bills right from your mobile device TRACK INVESTMENTS • Monitor balances, holdings, account activity and open orders for your Wells Fargo Advisors and WellsTrade accounts • Get real-time quotes, charts, market data and news MOBILE DEPOSIT • Deposit checks using your Windows phone ATM LOCATOR • Let us help you find a nearby Wells Fargo ATM DEPOSIT PRODUCTS OFFERED BY WELLS FARGO BANK, N.A. MEMBER FDIC. INVESTMENT AND INSURANCE PRODUCTS: NOT INSURED BY FDIC | NO BANK GUARANTEE | MAY LOSE VALUE Wells Fargo Advisors is the trade name used by two separate registered broker-dealers: Wells Fargo Advisors, LLC, and Wells Fargo Advisors Financial Network, LLC, Members SIPC, nonbank affiliates of Wells Fargo & Company WellsTrade accounts are available through Wells Fargo Advisors, LLC * Your mobile carrier's message and data rates may apply.